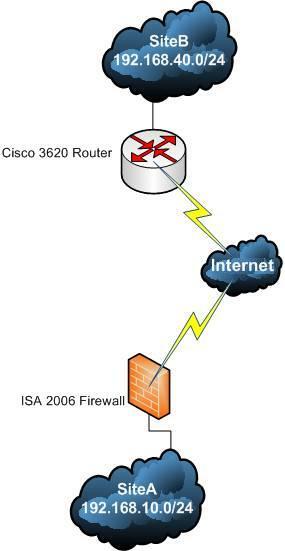 In this article we will establish a site-to-site VPN connection between an ISA 2006 Firewall and a Cisco Router. One site is using ISA 2006 Firewall Standard Edition installed on Windows 2003 R2 Standard SP2. The network behind the ISA 2006 Firewall is 192.168.10.0/24. The other site is using a Cisco 3620 router. If you wonder about the IOS type and version, it’s running IP/FW/IDS PLUS IPSEC 3DES(c3620-ik9o3s-mz), version 12.2(40). OK, the version is old but it will not matter since it supports 3DES. Also since it has the IOS firewall on it we can setup it as a firewall too. If you have newer versions of IOS, you can benefit from the enhanced firewall support. It’s all about the amount of money you have to spent(or about the router you have bought). The network behind the 3620 router is 192.168.40.0/24. Figure1 describes the network diagram. If you plan to build a quick lab, you can setup ISA 2006 in VMware(please refer to our article ISA VMware Simple Lab). Everything is identical except that the DMZ Server and the Client PC are not running. Also there are plenty of docs on Cisco and Microsoft sites related to IPsec tunnel mode site-to-site setup and troubleshooting. Let’s first configure ISA 2006. 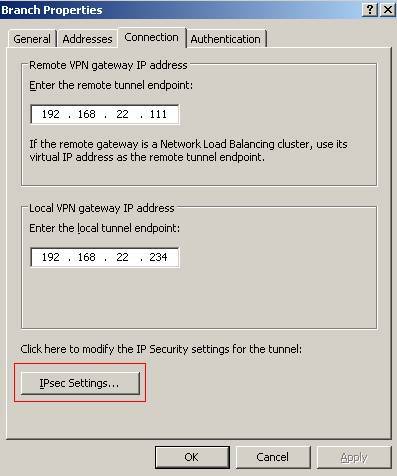 Since we already have explained some of these settings in our How to Create a VPN Site-to-Site IPsec Tunnel Mode Connection Between a Vyatta OFR and an ISA 2006 Firewall, we will not repeat them here. 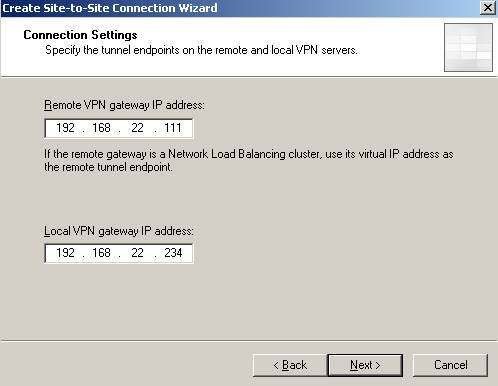 Head to “Virtual Private Network(VPN)” into the “Remote Sites” tab. I’m using a pre-shared key for this lab(see Figure3). 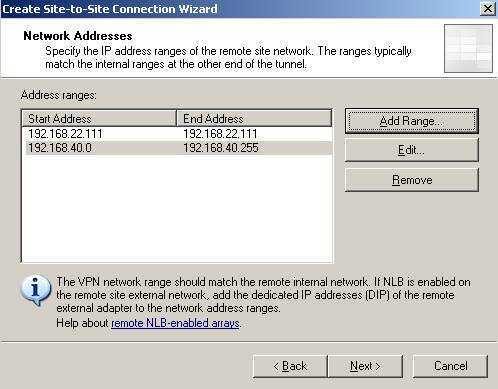 Specify the remote network address ranges(see Figure4). I also included(with ISA 2006 this is done automaticaly by the wizard) the remote endpoint IP address, 192.168.22.111 so I can test connectivity from it(I will do the same on the 3620 router for ISA). Create the network rule with a “route” relationship and the access rule allowing “All outbound traffic”. Click “Finish”. Now double click the Branch remote site, click “Connection” tab and “IPsec settings”(seeFigure5). Now we will configure the IKE Main Mode settings(see Figure6). IKE is defined in RFC2409, an “Internet Official Protocol Standards" (STD 1)”. Figure6 shows the parameters used for IKE Main Mode. ISA can use 2048-bit MODP Diffie-Hellman Group 14 but the Cisco router does not(it can use 1536-bit MODP Diffie-Hellman Group 5 which is not available on ISA). The IKE SA lifetime is set to 28800s(8 hours). On the Cisco routers this is by default set to 86400 seconds(24 hours). If you are curios, we are actually using a cryptographic suite presented in RFC4308(“Internet Official Protocol Standards" (STD 1)”), Suite "VPN-A”. In this RFC it is stated that if we use IKEv1 with Suite "VPN-A" we “must” set the IKE SA lifetime to 86400 seconds(24 hours) and the IPsec SA lifetime to 28800s(8 hours). However this is way to long if traffic it’s actually passing between the two sites. It is better suited to use by default IKE SA lifetime set to 28800s(8 hours) and IPsec SA lifetime set to 3600s(1 hour). The combination of 3DES and DH 1024 is not that strong these days(you can get some directions reading NIST Guidelines for Public-Key Sizes). Moving to IKE Quick Mode, you can see the ones used in this lab in Figure7. The IPsec lifetime is set to 3600s(1 hour). Cisco routers by default use the 3600s(1 hour) for IPsec lifetime. 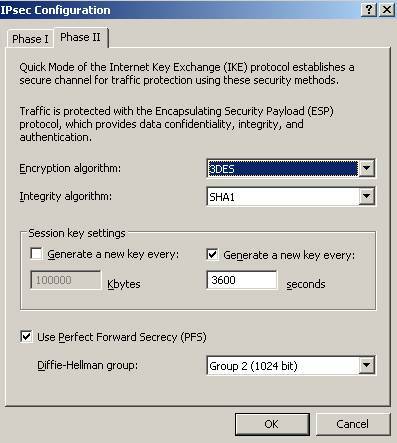 PFS for keys is used meaning that keys for ESP will be obtain by running a fresh DHE exchange and not derived from the keying material obtain in Main Mode. Therefore greater resistance to cryptographic attacks is achieved. No IPsec lifetime in Kbytes is set(IPsec life type are expressed in kilobytes and/or seconds, see RFC2407). Apply the new settings on ISA 2006. So by now ISA 2006 is configured. The remote site has been created, the access and network rules defined, the IKE parameters set and the remote network address range was specified. Note that there is an IPSec SA Idle Timer or an idle timeout for a Quick Mode SA. On Cisco routers the IPSec SA idle timer was introduced on Cisco IOS version 12.3. So I cannot apply this in my lab since I’m using IOS version 12.2. On Windows 2003 the IPSec SA Idle Timer can be set from registry. The default idle timeout for a Quick Mode SA is 300 seconds. You can modify it from registry(you can find the registry modification in KB 917025). If you are running ISA on a Windows 2003 SP1 this timer will apply even if there is traffic. You need to upgrade to SP2 to get rid of this issue(check this KB923339). Time to configure the Cisco router. We need to use the exact same settings for IKE parameters on the Cisco 3620 router(called R1). ISA 2006 Firewall is doing NAT from Internal to External. The Cisco 3620 will do the same thing. I suppose I should have used the Cisco Router and Security Device Manager (SDM), but that's the way it goes right now. From above, you can notice that 192.168.40.0/24 was excluded from the NAT process(access-list 111) when accesing 192.168.10.0/24 and host 192.168.22.234(actually the last exclusion is used by ISA 2006 for testing connectivity from it to 192.168.40.0/24). A default route was also created on the Cisco 3620 router pointing to my real LAN DG so that the router and hosts behind it to have access to the Internet. Test your configuration by trying to access a web site from a host behind the Cisco router. You should be able to do so. 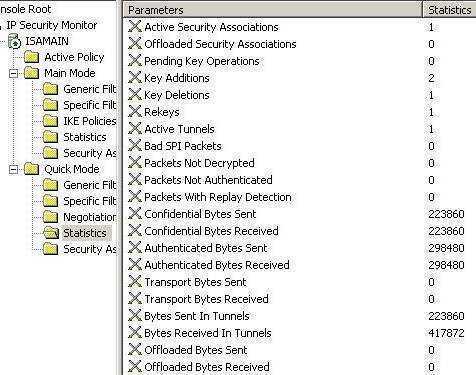 They do not match our ISA settings so we will create another policy, “isakmp policy 15”(seeFigure10). Check what we have done. 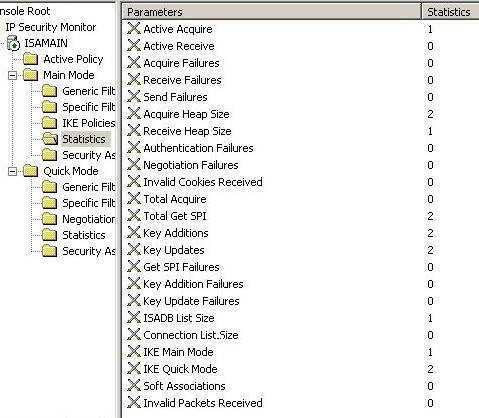 As you see(see Figure11) the settings of “isakmp policy 15” match the ones used on ISA 2006 for IKE Main Mode. We are using with isaset “transform-set” the same settings from ISA 2006 for IKE Quick Mode, we also enabled PFS. With “access-list 101” we will specify the network address ranges for the remote site. Let’s create the “access-list 101”(see Figure14). First line defines the remote network 192.168.10.0/24(which can be accessed by local network 192.168.40.0/24). The second line is used to allow connectivity testing from ISA 2006 to 192.168.40.0/24. And finnaly, the third one permits connectivity testing from the Cisco 3620 router to 192.168.10.0/24. Actually you can use the ping command on Cisco IOS to specify the source interface(thus the source IP) but it’s faster to just type ping X.X.X.X. And bind the “crypto map isavpn” to the outgoing interface “f0/0”(see Figure15). And that’s it. No firewall settings yet on the Cisco 3620 router. The router config can be found here. So let’s try and bring the tunnel up. To do so, we will ping from a host behind the Cisco router 192.168.40.2, to a host behind ISA 2006 Firewall, 192.168.10.2(see Figure17). 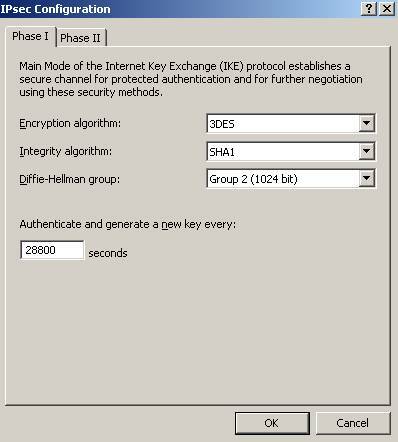 You can use Wireshark to capture the packets on ISA’s external interface and visualize the IKE negotiations and packets protected by IPsec ESP(see Figure18). You can use the ping command and by defining “extended commands” you can specify the source interface(thus the source IP address), see Figure20. Open the “IP Security Monitor” mmc on ISA and check on ISA the Main Mode and Quick Mode SAs(see Figure23 and Figure24). Since this IOS version has firewall capabilities we can secure the external interface. The bellow configuration is just basic stuff, some quick added lines to the router configuration. As said before the IOS version is old so the protocols supported with Context-Based Access Control are limited. First thing I will do is to add and extended-access list on the external interface to allow and block traffic. I will allow IKE, IPsec ESP, returning DNS traffic, returning ICMP replies to the router and traffic from 192.168.10.0/24 to 192.168.40.0/24(on newer IOS versions the last two lines of the access-list are not required). And I want to inspect HTTP traffic from 192.168.40.0/24 to the external world(if your IOS version has DNS support you can do the same for DNS protocol and delete the DNS line from access-list 121). For this I will use Context-based access control (CBAC). The “full firewall” configuration is here. You can try now to access a HTTP web site from a host behind the router(meaning that you will alos test that DNS is working if you use FQDN). I did so from 192.168.40.2. Note that with this config in place, hosts belonging to 192.168.40.0/24 are only allowed to access external resources using DNS and HTTP protocols. Don’t go to a HTTPS web site because it will not work. Actually you can for example configure the 192.168.40.0/24 computers to use ISA’s IP address 192.168.10.1 as their web proxy by creating an access rule allowing HTTP/HTTPS from Branch to External on ISA . Note that we already added the remote end-point IP addresses to the remote network address ranges on both sides. 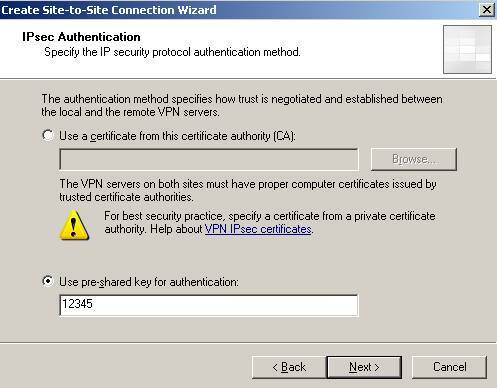 To block direct Internet access from hosts belonging to 192.168.40.0/24 use aproppiate access-lists. I have simulated some traffic between the two sites by using a ping command for over an hour. The tunnel stayed up and not a single packets was lost(except the ones from the start of the ping command when the tunnel was not up yet). A new Quick Mode was negotiated after an hour(as configured). See Figure29, Figure30, Figure31, Figure32.